This fully carved whare (house) is on the shores of Lake Rotoiti. It was opened in 1941 by Korokī, the fifth Māori king, who traced his descent from Tamatekapua. Rangitihi was another descendant, and the name of the building, Ngā Pūmanawa e Waru o te Arawa, refers to eight hearts – the collective name for Rangitihi’s children. The house was built for the descendants of these ‘eight hearts’. 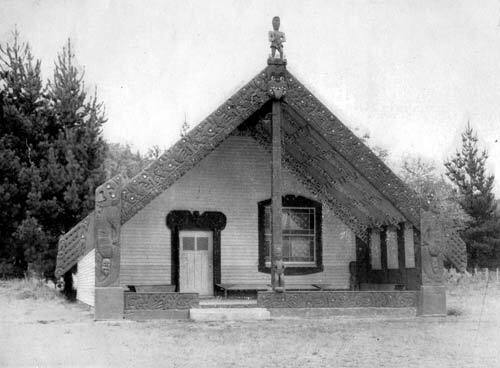 Reference: W. J. Phillipps, Carved houses of Te Arawa. Wellington: Dominion Museum, 1946–1948, p. 90.